This easy Jalapeño Cornbread recipe is full of spicy, cheesy goodness and makes a perfect side to pair with barbecued meats, chilis, or comfort foods of any kind! 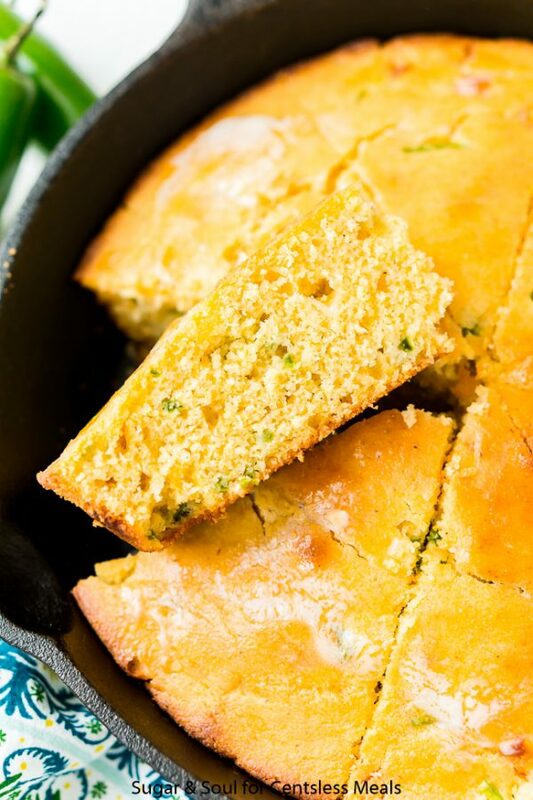 Foodies who love mac and cheese, chili, or barbecued meats know that nothing goes with a heaping plate of comfort food like a buttered piece of cornbread, and this Jalapeño Cornbread recipe will be your new favorite. Moist, buttery, and slightly sweet, Jalapeño Cornbread also has a generous amount of Colby Jack cheese and a kick of jalapeño spice! Cornbread is one of those nostalgic family favorites that goes with just about everything. It’s hearty, easy to make, and always a crowd-pleaser, plus this version has a deliciously spicy twist! While you really can’t go wrong with any kind of cornbread, I love Jalapeño Cornbread because it’s deliciously flavorful. Flour and cornmeal are still at the heart of this recipe, but a little sugar adds a touch of sweetness that’s complemented by rich and melty Colby Jack cheese. And don’t forget the jalapeños! Aside from adding a bit of heat to the bread, these peppers are packed with fresh, savory flavor. 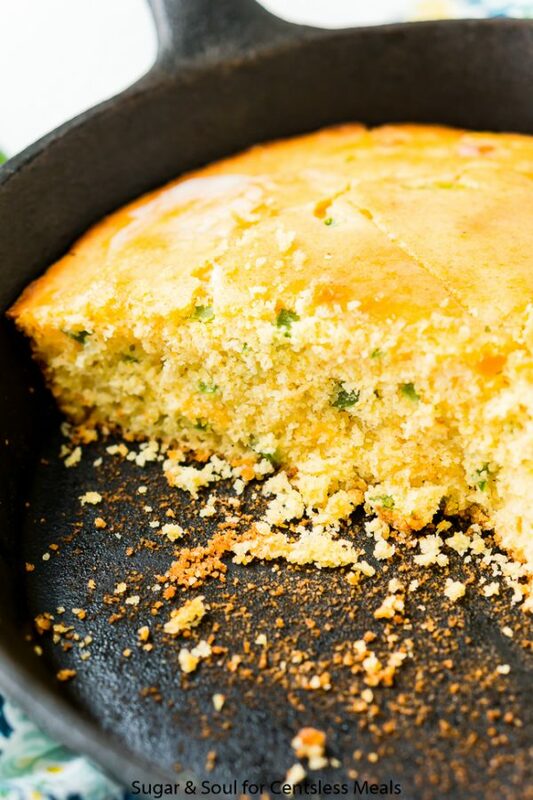 Personally, I like a little spice but not too much, and Jalapeño Cornbread has just the right amount of sizzle. 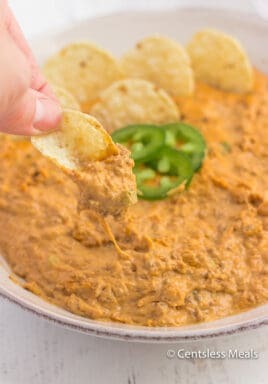 When it’s served with creamy mac and cheese or chili topped with a dollop of sour cream, the dairy balances out that spiciness and it’s so good! 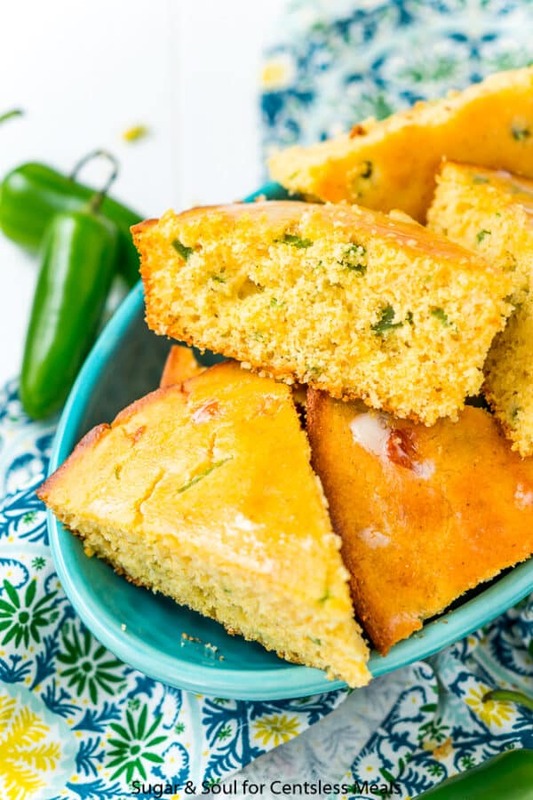 Try making this easy Jalapeño Cornbread recipe to bring to cookouts, potlucks, and parties! Whether you’re making chicken, ribs, steak, burgers, pasta, baked beans, or soup, you’d be hard pressed to find someone who doesn’t want to a square of this stuff on their plate! 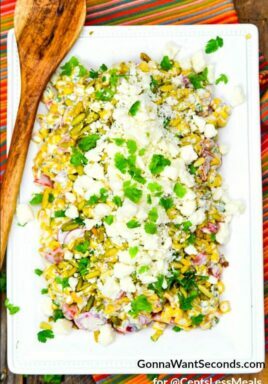 In fact, you’ll find yourself making this recipe for meals and get-togethers all year long. Jalapeño Cornbread is just as enjoyable at summer shindigs as it is at cozy fall gatherings and on cold winter evenings. Cornbread is really easy to make from scratch and of course, there are a million flavor combos from spicy jalapeno to sweet honey. To make this cornbread, begin by preheating the oven to 425 degrees F and greasing a 10-inch cast iron skillet with butter, and set the prepared pan aside. Next, you’ll combine the corn meal, flour, sugar, baking powder, and salt together in a large bowl and whisk it together. Then, in a separate medium bowl, whisk together the milk, eggs, and oil. Add the wet ingredients to the dry ingredients and stir with a wooden spoon just until combined. 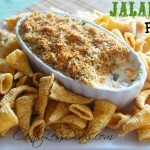 Fold in the jalapeno peppers and cheese and pour the batter into the prepared skillet. Bake the cornbread for 25 minutes before removing from oven and spreading the butter over the top of the cornbread. Cut into wedges (or squares) and enjoy. Cornbread tends to be a comforting staple for warm, wholesome meals, especially those shared with the ones you love most. That’s why everyone should have a winning recipe on hand, and this foolproof Jalapeño Cornbread will be your family’s new favorite! 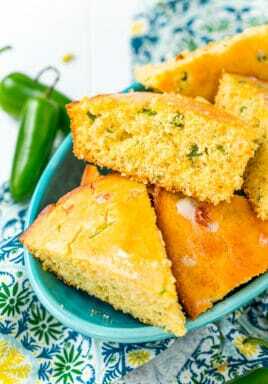 Simple and flavorful Jalapeño Cornbread goes with countless dishes and can be enjoyed all year long! Keep this recipe handy to share with friends and family or to complete a meal for a low-key dinner at home. Preheat oven to 425 degrees F and grease a 10-inch cast iron skillet with butter and set aside. In a large bowl, combine the corn meal, flour, sugar, baking powder, and salt. In a separate medium bowl, combine the milk, eggs, and oil. Add the wet ingredients to the dry ingredients and stir just until combined. 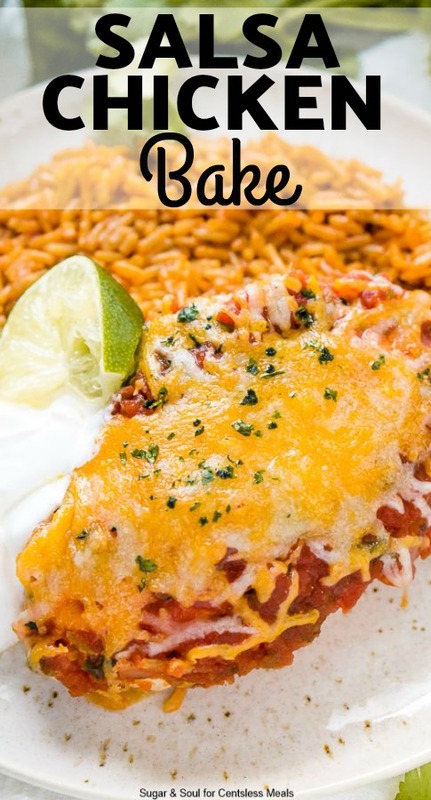 Fold in the jalapeno peppers and cheese and pour the batter into the prepared skillet. Bake for 25 minutes. Remove from oven and spread the butter over the top of the cornbread. Cut into wedges and enjoy. REPIN this Easy Cornbread Recipe!